An extensive set of advanced monitoring, control and information management technologies can be used to increase a building’s Energy Intelligence Quotient (EIQ) – a measure of the degree to which cost-effective intelligence has been deployed. But which intelligent technologies can be applied cost-effectively to a given building? 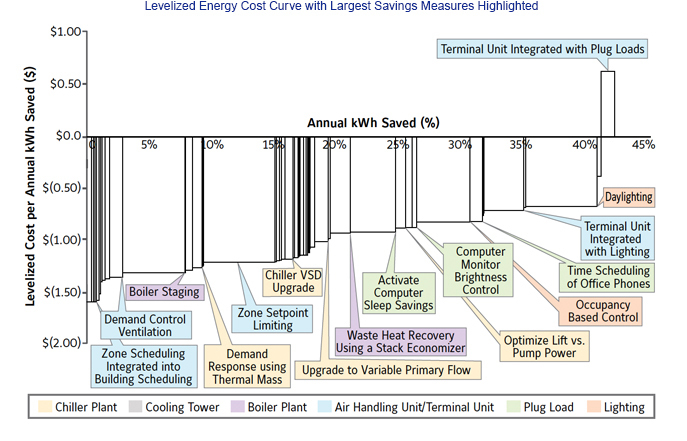 The paper describes how to analyze the economic value of intelligence measures for a wide range of building systems: chiller and boiler plants, cooling towers, air-handling/terminal units, lighting, and plug loads. It demonstrates the evaluation process using a reference building in Washington, D.C., but the basic process can apply to any building, once adjusted for the structural differences and the energy and labor costs specific to the location. The paper demonstrates the use of simple payback and net present value for each intelligence measure as a basis for assessing and prioritizing among building intelligence investment options. The analysis bundles the technology improvements into packages of measures based on simple payback, and looks at the cumulative NPV of each bundle. The analysis then shows how a cost curve showing the marginal cost per annual kWh saved for all the measures (show below) might be used to make investment decisions.